The Motel La Cheminee is a very clean, fresh little motel with very friendly owner. 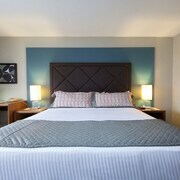 Fast internet, nice large TVs, comfort bed and linens. Also very reasonable prices. Manager very helpful. Bathroom needs sprucing up & corners need cleaning. Tub drain clogged. Situated in Saint-Sauveur, this motel is within a 15-minute walk of Laurentian Ski Museum and Mont Saint-Sauveur. Polar Bear's Club is 2.5 mi (4 km) away. It was an OK experience..you get what you paid for..the room is not excellent but fine..dissapointed with WIFI service as does not work well on ground floor..staff said it works fine on second floor only. Motel is old room is a small size. overall it is good. But the bed was little saggy. After 2 nights stay, my back started aching. Nicely renovated bedrooms, comfortable mattress. Excellent value for the price. The proprietor obviously takes pride in running the business. Beautiful new little hotel ( in renovations currently ) close to the st Michel metro so easy to get around. very friendly staff very clean rooms. stay away from the bar next door.